The oxygenated fuels do provide additional power but come at a price. First being the hefty dollar per gallon price and secondly all the oxygenated fuels are extremely hard on the internals and very corrosive After running the engine with oxygenated fuel to minimize the corrosive effects of it you should run regular fuel through it. The octane rating of gasoline is a standard measure of the performance of a fuel. As a rule of thumb, the higher the octane number, the more compression the fuel can withstand before detonating—”pinging” in motocross nomenclature. In its simplest terms, fuels with a higher octane ratings are used in high-compression engines to fight against detonation. In contrast, fuels with lower octane numbers can be used safely in most stock four-stroke motocross engines. The compression ratio of your engine determines how much octane your bike needs. Hopped-up engine tend to have higher compression ratios, created by high-compression pistons or milled heads. The advantage of a high compression ratio is that it gives your engine more horsepower and more punch. The disadvantage of a high compression engine is that it requires more octane to avoid pinging—and, of course, that fuel costs more per gallon. Races are won by playing a game of chicken with your engine. The more ignition and heat the combustion can handle, the more horsepower the engine will make. But too much ignition timing and heat will cause the engine to say sayanara. This is where racing fuel and high octane come into play–they allow the engine tuner to dance closer to the edge of disaster. Race fuel is not a magic elixir. No fuel can deliver the best of everything, but if you know what you are aiming for you can find a fuel that will deliver the performance you want. Octane is a rating of a fuels ability to resist detonation. 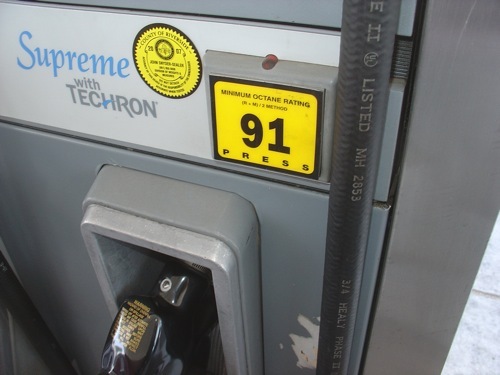 Octane is rated in its Research Octane Number (RON) and Motor Octane Number (MON). However, the number you see on the pump at your gas station is neither the RON nor the MON, but a combined number derived by adding RON and MON together and dividing it by 2 (R+M/2). This number is called the anti-knock index number (R+M/2). Most racing fuels do not list the anti-knock index number, preferring to list the Motor Octane Number (MON). Why? Because MON numbers are calculated by putting the fuels performance under a heavier load than the RON method. You need to read carefully which octane number is being bandied about in advertising claims. Many fuels like to show their RON number because it is typically higher, but MXA believes that the MON number is more indicative of what a fuel will do in racing applications. There is an octane fixation in racing circles and it is misplaced. An engine only needs as much octane as it needs. Your stock engine will live happily ever after on 91 octane fuel and if you think feeding it 108 octane fuel will make it faster, you are wrong. If you run fuel with too much octane for your engines compression ratio it will have sluggish throttle response, an incorrect burn rate and the unburned fuel will end up costing power instead of making it. High octane fuel burns slow and low octane fuel burns fast. This is referred to as “burning speed.” Combining the correct fuel for the combustion ratio and ignition timing of your engine is critical for max performance. As a rule of thumb, there is very little time for the fuel to burn during the pistons combustion stroke. The engine should reach its peak cylinder pressure (the pressure forcing the piston downward) at 20 degrees after top dead cylinder. If your fuel is all burned up before this or not done burning after this, it does not contribute to the forces exerted on the piston and by proxy the forces exerted on the rear wheel. Since octane is a major factor in the speed at which fuel burns, you have to run the best fuel for your setup. Just as important as the octane rating is the energy value of a given fuel. For racing fuel the energy produced is measured in BTUs (British Thermal Units). One BTU is the amount of energy needed to heat one pound of water (0.1198 gallons) from 39°F to 40° Fahrenheit. In racing fuels, the energy value is measured in BTUs per pound–not per gallon. Why? The air/fuel ratio is in weight, not a volume. Word to the wise. All production motocross engines are designed to run on the 91-octane, unleaded premium that can be purchased at the gas station down the street. If the engine can use pump gas under a race load without detonating, you seldom find hidden power in $25 a gallon race gas. However, it should be noted that there are race fuels that can produce more power on engines that are not detonating, especially oxygenated fuels, but it is up to the rider to decide if he wants to spend more money on the fuel. One caveat: Pick the wrong fuel and you will lose power. The good fuels for stock engines would be VPR, U-4.4 and T4 (and for more money MRX02 and MR12). Freshness counts in fruit and fuel. It is often stated that fuel kept a metal gas can will last a couple years, but this is not true of all racing fuels. A non-oxygenated fuel could stay fresh for a couple years, but an oxygenated fuel should always be used within one calendar year (if you want it to deliver on its oxygen content). Fuel kept in a plastic gas can should always be used within two weeks. Why? Plastic is porous and even though gasoline does not leak out, the best parts of the fuel can evaporate through the plastic. If you want to extend the life of your fuel, take it to the races in a plastic gas can, but when you come home, pour it into a steel can.